There were lots of beautiful dresses in this book! Gosh, it makes me want to go shop and just BUY beautiful dresses. Sadly, I'm a broke medical intern. So no excessive shopping for me. But I can live vicariously through this book! 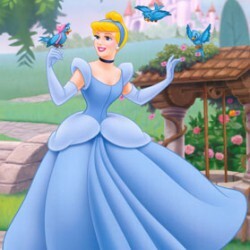 Seriously, the dresses sound absolutely stunning! And if you wouldn't read it for the fabulous fashion (see, I can do alliteration), you could for the heartstopping romance! OMG, it was just so good! They are both amazingly flawed characters and I just loved it. They fitted together so perfectly and the chemistry was just... so good! Clevedon made me swoon with his caring for Marcelline's little girl and for Marcelline herself. Seriously, it was a good thing noone was around while I was reading this, cause I had tears in my eyes and must have looked a little crazy towards the end when I just had to keep reading to finish the book before I had to leave for class. 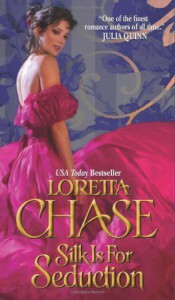 I'd never read anything by Loretta Chase before, but I sure will again after this book! I so love me a strong but sweet male character and this book had one for me. Though his name did make me gag a bit: Gervase. Seriously, I'm glad we didn't get to know that until right before the end, because it took some of his attractiveness away for me. But: really good historical romance! Go read if you enjoy the genre!